William Wilfred Larder Cuthbert was born on March 11th, 1888, the son of a Grimsby coal dealer and waggonette proprietor. Schooled locally, he nevertheless showed sufficient academic prowess to go up to Christ's College, Cambridge, in 1906. He had begun to show promise as an amateur with Grimsby Town and continued to play sport at university, where his brilliant mind matured; a mathematician, Will secured a double-first in chemistry and physics and added teaching qualifications to that, graduating in 1909. Will's first job in the academic world came at the Chesterfield Grammar School, where he was installed as teacher of chemistry in the year of his graduation. He resumed an active sporting life, playing cricket with the Chesterfield club, for whom he was an aggressive, free-scoring batsman, and playing football with Chesterfield Town FC. 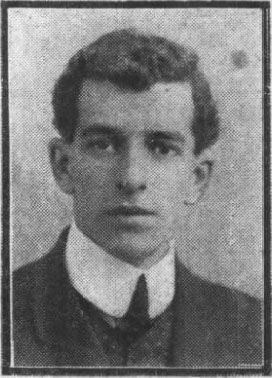 He joined the Spireites in 1910 after injury had robbed the club of the service of Emerson Marples, the veteran full-back. Cuthbert was probably a better wing-half, but was good enough at right-back to claim that spot as his own. Cuthbert was an important member of the side that enjoyed a famous FA Cup run in 1910-11. As a Midland League side, Chesterfield Town knocked out Bolton Wanderers, then flying at the top of division two, and gave Chelsea a run for their money in the equivalent of the modern fifth round, holding a halftime lead before losing 4-1. In the Chelsea team that day was VJ Woodward, a leading member of the England Amateur side, and thanks to his performance in that game, Cuthbert found himself called up to play three amateur internationals in 1911. In that era the amateur side was probably just as good as the full England one, and several players - Woodward being one - was good enough to play in both. Cuthbert was further invited to tour with the English Wanderers side, who were the England Amateur side in all but name, to Central Europe, Scandinavia and Russia. Cuthbert's football career was cut short by cartilage injury not long into the 1911-12 season. He continued to teach, but a family story tells of an experiment that went wrong, leaving Will poisoned by fumes and advised to seek work in a warmer climate to recover. So it was that Will boarded a boat for Sao Paolo in 1913 to take up a position at the Anglo-Brazilian School in that city, a boarding school for Brazilian boys seeking the benefits of an "English" education. He resumed active participation in sport, playing cricket for the Sao Paolo State side against other teams of English ex-pats, while becoming the first man to make a break of 100 on the Sao Paolo Athletic Club billiard table, where he would have met and socialised with Charles Miller, acknowledged as the founder of Brazilian football. Will married, and had two daughters, and enjoyed life in his adopted home. That good life came crashing down during what became known as the Constitutionalist Revolution of 1932, the climax of several years of unrest in which national resentment at the power centred in Sao Paolo came to a head. The city was subject to 87 days of bombardment from the Brazilian military before the "Paulistas" conceded defeat. In all that time, Will Cuthbert took it upon himself to care for the boys in his school, sheltering them while going out to forage for food and water while the bombardment took place. The strain of this left Will mentally incapacitated and, although he made some recovery, he was never the same man, mentally or physically, again. Will withdrew from academic life but continued to teach privately. His slow physical decline ended with his death in Sao Paolo on May 24th., 1957.